"This recipe works best when baked in a convection oven, it allows the herbs to fully flavor the dish." 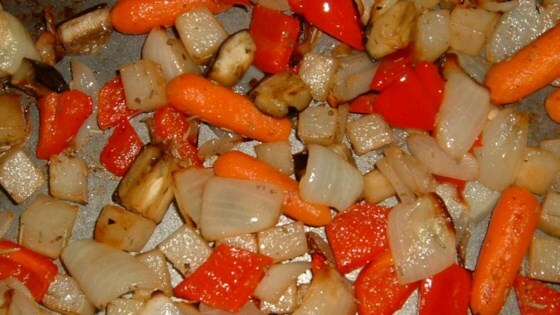 Combine potatoes, carrots, and onion in an ungreased 13x9 inch baking pan. Combine olive oil, lemon juice, garlic, rosemary, oregano, salt and pepper to taste in a small mixing bowl. Drizzle the mixture over the vegetables. Remove the baking dish from the oven and add eggplant and bell pepper. Toss to combine the eggplant and bell pepper with the other vegetables. Return the pan to the oven. Bake for 13 to 15 more minutes or until the vegetables and tender and brown on the edges. Serve hot. I have made these 3 times in the last two weeks. They are easy and so tasty. I left out the eggplant (personal preference) and didn't miss it a bit. very tasty but I found that the aubergines needed more time than the recipe said. maybe next time I'll put them in with the potatoes. This dish is wonderful. It went will with a roast turkey I made! I added all of the vegetables at the same time before tossing with the marinade, they cooked up really nice.